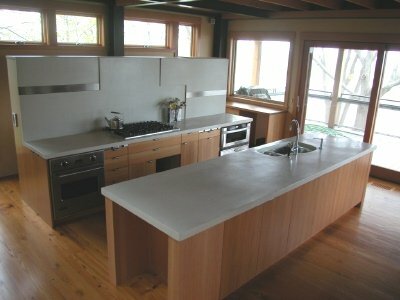 There are a few different looks you can achieve when you polish a concrete countertop. You will need an orbital hand held sander or a hand polisher. You will also need wet diamond polishing pads from 50 grit to 3000 grit depending on the look you are trying to achieve. EXPOSED AGGREGATE - You achieve this finish by removing enough surface material to expose the underlying aggregate in the countertop mix. You will need a professional hand polisher to best achieve this look. SALT AND PEPPER - You achieve this finish by removing just enough surface material to expose the underlying sand in the mix but not enough to expose any of the aggregate. SMOOTH - You achieve this finish by just honing the surface lightly with an orbital sander or hand polisher and a diamond pad. Polishing with water can be a little messy, but it's not dusty. Breathing cement dust is harmful and the dust gets all over everything, unless you have a professional grade vacuum. So prepare for a little wet cement slurry as you are polishing. Cover the floor and wear an apron. TIP - Finishing or Polishing concrete countertops using these techniques is done the next day and in some cases 3 - 7 days after the concrete countertop was poured. Smoothing the concrete mix with a hand trowel is the only technique you will use on the day the countertop is poured. The concrete has to achieve a certain level of hardness or strength to be able to polish it correctly. Depending on what kind of concrete mix you used will determine when you start polishing the concrete. I polished this concrete bar top starting with the 50 grit pad and finished with the 3000 grit pad. 1. If you just want a smooth surface, start with the orbital sander and a 200 grit polishing pad. Sponge some water on the surface of the countertop to completely wet it. Keep the surface wet as you run the orbital sander over the entire surface of the countertop. Lightly go over the entire countertop surface to remove any imperfections and smooth the surface. Clean the surface with water and a hand squeegee. If it looks good, with no scratches or pin holes then you are done. The concrete polisher to the right is one of the two different types of polishers I use. You can get it on Amazon. It comes with the backer plate and all the diamond pads from 50 grit up to 3000 grit. 2. If you want a salt & pepper look or an exposed aggregate look, then start with the 50 grit polishing pad. 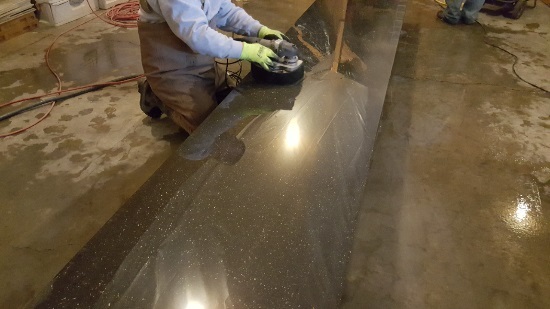 Wet the entire countertop surface and keep it wet as you are polishing. Remove just enough surface material until you achieve close to the look you are going for. Take the 50 grit pad off and put on the 100 grit pad. Continue to wet the surface and run the polisher over the entire countertop surface until you have achieved the look you desire. Move up to the 200 grit pad and continue to polish the surface, remove the dirty slurry water from the surface and add clean water as you are polishing. Go from the 200 grit pad to the 400 grit pad, the surface should really start to feel smooth and hard now. After you're done with the 400 grit pad, clean the entire surface area with water. 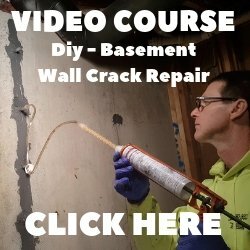 You should notice some pin holes in the surface of the concrete countertop. This is normal. Finishing concrete countertops without any pin holes requires mixing up a batch of slurry from your concrete mix (cement and water). This slurry can be about the texture of pancake batter. Cover the entire surface area of the countertop with this slurry, filling in all the pin holes. I usually just use my hands with plastic gloves on to do this. Push the slurry mix into the pin holes with your fingers. You can also use a grout trowel or even a sponge. 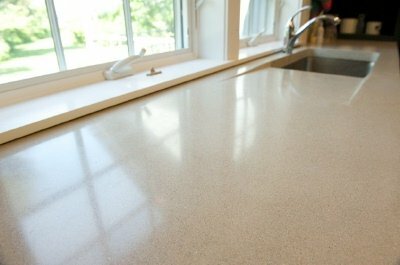 Scrape off any excess slurry, leaving a light film over the entire countertop surface. Let this dry overnight. The next day, lightly go over the countertop with the 400 grit pad and water one more time. This will remove the film of slurry and all the pin holes will be gone. If you like this matte finish you can stop here. If you desire a highly polished finish, continue to polish the surface as before using polishing pads from 800 grit to 3000 grit. Once you get to the 3000 grit pad the surface will be very glossy and reflective. This is the one you see me using in the picture above. The base has 3 heads instead of just one. It'll cut your polishing time in half. It doesn't come with the diamond pads, make sure you don't forget to get three of each grit. Both of the polishers I'm showing you work very good. Both will get the job done. It just depends on how long you want to spend polishing. It took me a couple days to polish the one you see me doing in the picture. Disclaimer: I am an affiliate of Amazon. If you decide to purchase one of these concrete polishers within 24 hours of clicking on the picture I will receive a small commission. Thank you for that if you do. 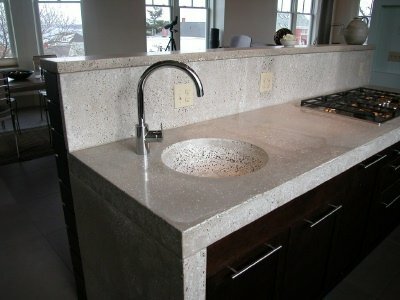 CHENG has a great video about finishing concrete countertops that shows this process in detail. Here's 3 books by Fu-Tung Cheng you can purchase on Amazon.com if you want to. 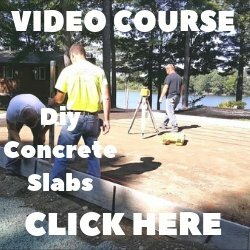 These books will teach you about forming, pouring, polishing and sealing a concrete countertop.